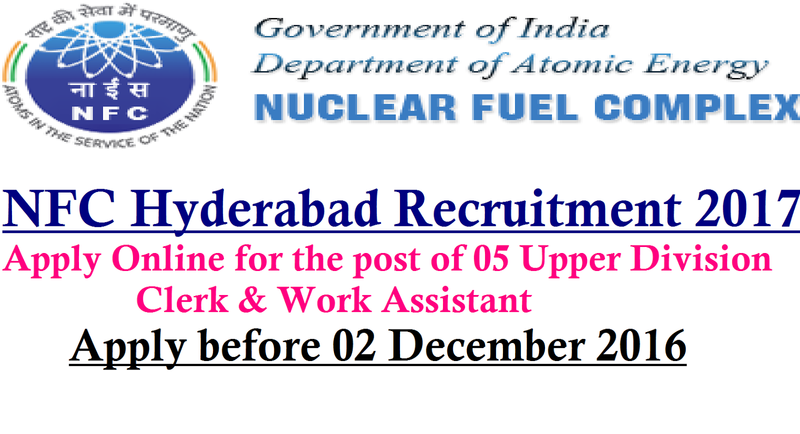 NFC Hyderabad Recruitment 2017|Nuclear Fuel Complex (NFC) Hyderabad invites application for the post of 05 Upper Division Clerk & Work Assistant for PWD Candidates. Apply before 02 December 2016. For Upper Division Clerk : A degree in Arts, Science or Commerce of recognized University or equivalent with an aggregate of 50% marks. For Work Assistant : Tenth Pass. How to Apply NFC Hyderabad Vacancy : Interested candidates may apply in Prescribed Application Form along with attested photo copies of certificates send to the Administrative Officer, Recruitment – I, Nuclear Fuel Complex, ECIL Post, Hyderabad – 500 062 on or before 02.12.2016.